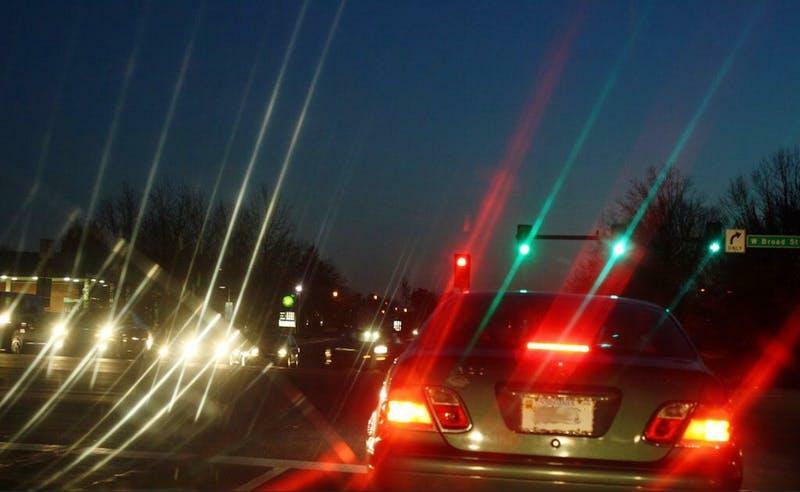 People are sharing this photo of car lights because it's opening their eyes to the possibility they may have astigmatism. When I was 15, I didn't really take the news I needed glasses very well. By which I mean I walked outside, tore up the prescription, and threw it in the trash because I could see just fine, gosh darn it. If Batman didn't need to wear glasses, then I didn't need to wear glasses, thank you very much. Years later, when I was all grown up, I went to another eye doctor and it turns out I didn't need glasses anymore... and I have to admit I was a little let down. Either my eyes magically healed over time, or one of these doctors has no idea what they're talking about. I'm going to go with the former because it makes me feel cooler. 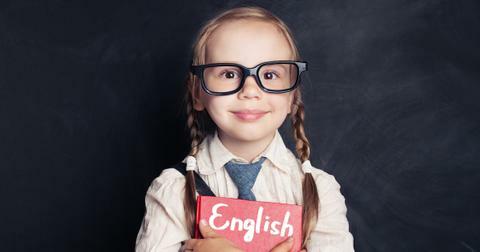 It turns out though, there are some surefire ways to tell whether or not you need glasses. The obvious is if you have difficulty seeing and registering things other people can see clearly (duh). But there are are other, more specific ways that are less apparent. But you don't necessarily have to see the world like some type of cyberpunk fantasy world before the cyborg's focus receptors have been calibrated. Tons of people walk around during the daytime and see the world perfectly fine. Once nighttime hits, however, and they're in an area with some bright lights, things tend to get a bit hazy and streaky. 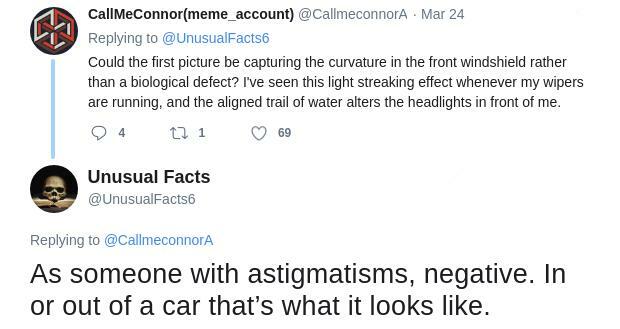 Twitter user @UnusualFacts6 explained what causes astigmatism, along with a photo of what it looks like to drive at night when you've got the condition. The human cornea should be totally round. Astigmatism, however, occurs when the cornea is slightly curved instead, which could cause the eye to perceive light as it appears in the image below. When someone has astigmatism, the light that enters the eye focuses on different parts of the retina at once, like a prism, which results in the streaks that you see in the photograph above. 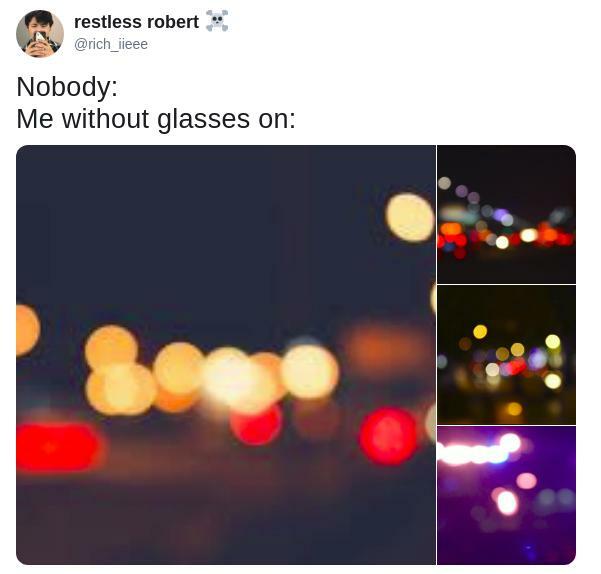 For the sake of comparison, @UnusualFacts6 uploaded another photo of a nighttime road, showing what it looks like to drive without astigmatism. And this made a lot of people realize something — they might need to make an appointment with the eye doctor. Usually, astigmatism manifests as a bunch of "circle mirrors" surrounding the actual image. 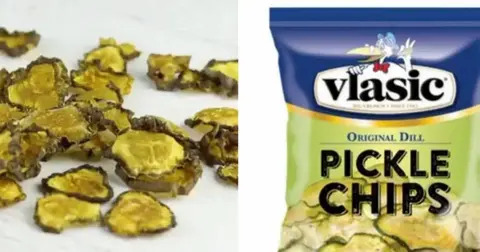 Users with astigmatism began tweeting out photos of what life with the condition looks like without wearing glasses/contacts versus when they are. 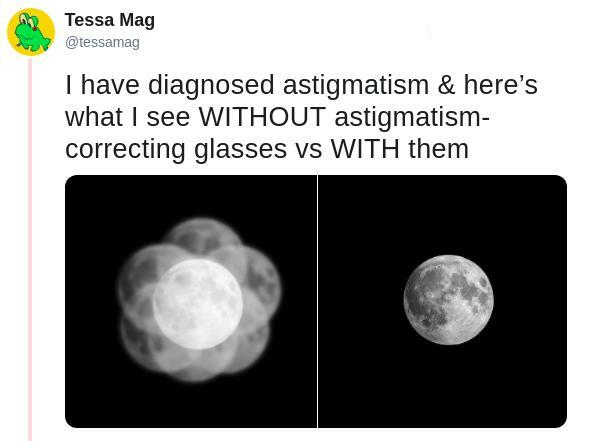 Astigmatism doesn't just cause people to view some trippy images from time to time; symptoms include strained eyes and being forced to squint. 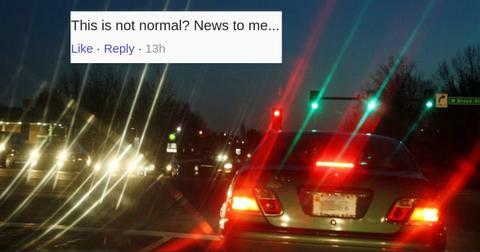 After the post went viral, some people were reluctant to believe astigmatism is what causes the "streaks" in the lights of the photo. 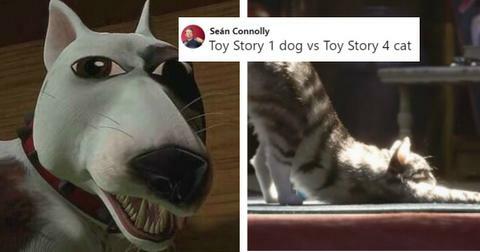 But it didn't take long for those with the condition to confirm that yep, @UnusualFacts6 is right. Then there were a number of people who seemed to be discovering for the first time that the light streaks weren't a normal occurrence. Here they were, living their whole lives not knowing they had astigmatism. 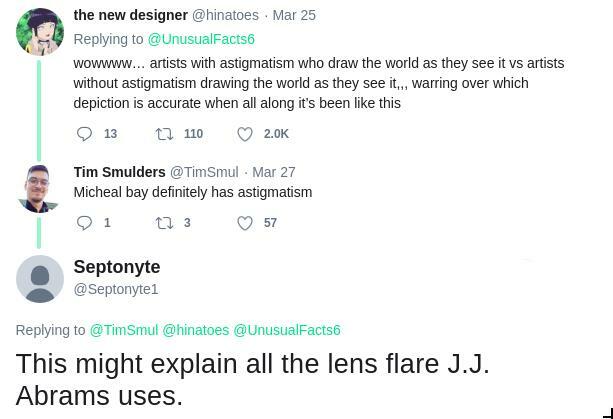 This sparked a conversation about how astigmatism could potentially affect the work of prominent artists and influence how they approach their work, like film directors Michael Bay and J.J. Abrams. 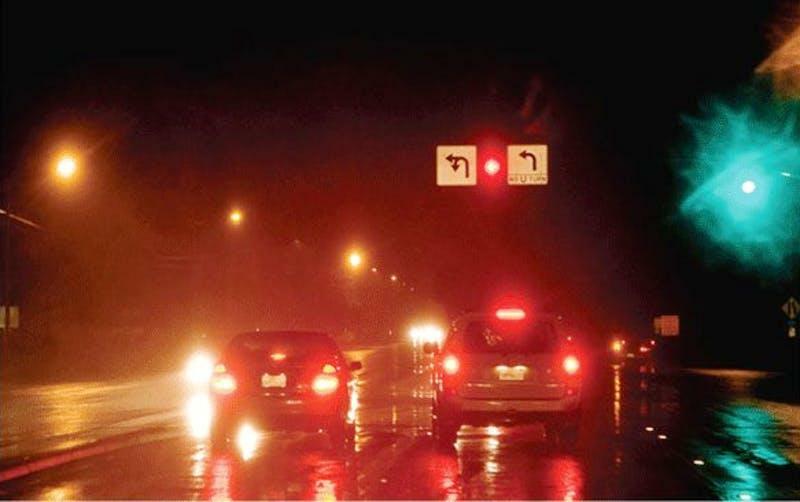 I know I'm going to be paying a lot more attention when I drive at night now, because I do recall seeing some streaky lights from time to time when I'm on the road at night. But maybe that's only when I get tired? I don't know, I just really feel like 15-year-old me right now and don't want to have to wear glasses. I need to build myself up to accept that again.